For the purpose of the DPA and GDPR we are the data controller and any enquiry regarding the collection or processing of your data should be addressed to Nicholas Papworth at our address 70 – 72 The Havens, Ipswich, Suffolk, United Kingdom, IP3 9BF. We will collect personal data on this Website only if it is directly provided to us by you the user, e.g. your e-mail address, name, home or work address and telephone number, and therefore has been provided by you with your consent. Normally you will only provide such details if you sign up to the ebusiness boss mailing list or you are making a purchase from us. We also use analytical and statistical tools that monitor details of your visits to our website and the resources that you access, including, but not limited to, traffic data, location data, weblogs and other communication data (but this data will not identify you personally) Data profiling is used to continually improve the quality of our products, services, communications etc. eBusiness Boss will use your information to collate statistics or informative summaries about topics such as (but not limited to) customer names, city, state and postcode along with customer behaviours, booking patterns and trends etc., eBusiness Boss may use automated decisions based on any findings regarding this data for Facebook custom audience marketing communication with content related to a previous purchase you have made or that other customers similar to you have made. If you would like to opt-out, please email us at contact@ebusinessboss.co.uk alternatively, you will have the option to unsubscribe at the footer of each email. Your payment information (e.g. credit card details) provided when you make a purchase from our website is not received or stored by us. That information is processed securely and privately by the third party payment processors that we use. eBusiness Boss will not have access to that information at any time. We may share your personal data with our payment processors, but only for the purpose of completing the relevant payment transaction. Such payment processors are banned from using your personal data, except to provide these necessary payment services to us, and they are required to maintain the confidentiality of your personal data and payment information. No person below the age of 13 should be using or interacting with this website. Where you have consented to receive our business boss email list correspondence, from time to time to provide that to you. The email list content will relate to “making money online”, there may be links to related affiliate products, along with products of our own. See section 22 for further details on third party links. If you do not want us to use your data for our use, you will have the opportunity to withhold your consent to this when you provide your details to us on the form on which we collect your data, or you can do so by writing to us at the address detailed in clause 2, or sending us an email to contact@ebusinessboss.com at any time. If you have given us consent to use your data for a particular purpose you can revoke or vary that consent at any time. If you do not want us to use your data or want to vary the consent that you have provided you can write to us at the address detailed in clause 2 or email us at contact@ebusinessboss.com at any time. 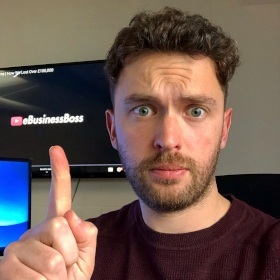 If you have opted in to the eBusiness Boss email list you will have the option to manage your preferences or unsubscribe at the footer of each email, should you choose to unsubscribe your data will be deleted. You might find links to third party websites on our website. These websites should have their own privacy policies, which you should check. We do not accept any responsibility or liability for their policies whatsoever as we have no control over them. Within the website, there may be links to certain products and websites, from these sites we may make an affiliate commission for any purchases you make. You can find full details of our affiliate disclaimer, within the footer of our homepage. The cookies used by our website fall into four categories. The categories are: strictly necessary, preferences, statistics, and marketing. The DPA and GDPR give you the right to access information held about you by us. Please write to us or contact us by email if you wish to request confirmation of what personal information we hold relating to you. You can write to us at the address detailed in clause 2, above, or by email to contact@ebusinessboss.com There is no charge for requesting that we provide you with details of the personal data that we hold. We will provide this information within one month of your requesting the data.